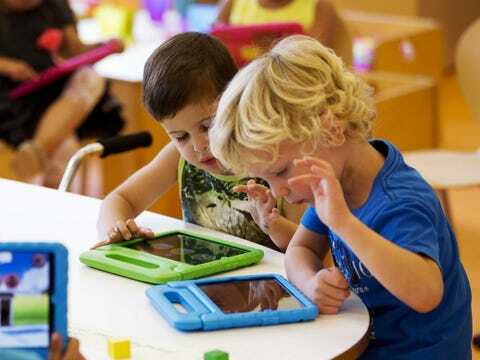 According to the British Association of Teachers and Lecturers, children who are 3 and 4 don't have dexterity in their fingers because they're too addicted to swiping tablet screens. The children know how to use the devices, but they barely know how to play with actual toys. "I have spoken to a number of nursery teachers who have concerns over the increasing numbers of young pupils who can swipe a screen but have little or no manipulative skills to play with building blocks or the like, or the pupils who cannot socialise with other pupils but whose parents talk proudly of their ability to use a tablet or smartphone," said teacher Colin Kinney at the association's annual conference, according to The Telegraph. The Telegraph reports that in addition to this, the memory of some older children is deteriorating because of over-exposure to computers. According to one teacher, these children couldn't finish traditional tests using pen and paper. Pew Research shows that one-third of Americans owned a tablet in 2013. And "among parents with minor children living at home, tablet ownership rose from 26% in April 2012 to 50% in May 2013." The National Association for the Education of Young Children says that "when used intentionally and appropriately, technology and interactive media are effective tools to support learning and development." But it also warns that exposure to interactive media should be limited, especially for young children.